Extracts made from Stevia rebaudiana, a tender perennial plant, provide a food and beverage sweetener rated 30 times sweeter than sugar. Similar to other artificial sweeteners, such as sucralose, your body does not metabolize the glycosides from the Stevia leaf or any of its processed forms. Stevia contains no calories. 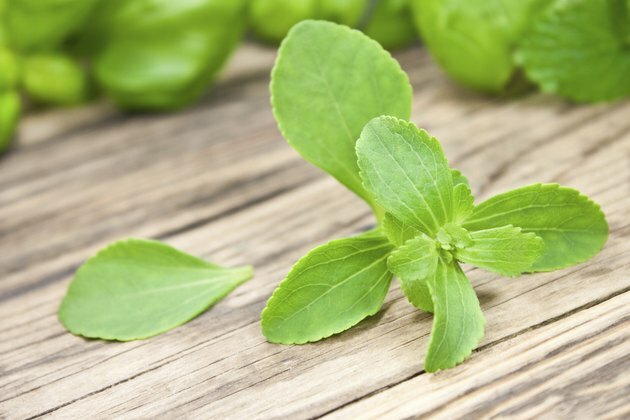 Many people have found Stevia to have an unpleasant aftertaste, which caused manufacturers to add other ingredients such as dextrose or maltodextrin to make a more pleasant-tasting blend. The amounts of these added ingredients may affect overall calories, but not to a significant degree. The highest reported calorie content of Stevia blends is a single calorie per 1 g packet. Any calories in Stevia blends come from carbohydrates. Your body does not recognize or process Stevia extracts as a carbohydrate, but since Stevia blends contain additional sugars such as dextrose or maltodextrin, many Stevia extract-containing blends do contain a very small amount of carbohydrates. Typically less than 0.5 g of carbohydrate is in a 1-g Stevia blend serving. Stevia contains no calories from fat. However, sugar substitutes such as Stevia may not be fooling your body. As reported in TIME in February 2008, scientists at Purdue University showed that animals fed with artificially sweetened food consumed more calories and gained more weight than animals eating food flavored with glucose -- a natural, high-calorie sweetener. The research supports the claim that artificial sweeteners disrupt your body's ability to regulate incoming calories and may help explain why people using artificial sweeteners have trouble losing weight.